It can become overwhelming trying to find the right breastfeeding pump in the beginning. You don’t want to buy one and then find out later that it doesn’t work the way you expected it to work. And now you can’t return it because of personal hygiene issues stated in the return policy about breast pumps. So how do you know which breastfeeding pump is the right one for you before buying one? • Usage- Long term or short term. Short term means you don’t plan on pumping for a long time. Say, you just want to pump for a few months or you only need to pump when you go for a night out away from your baby every once in awhile. Long term means you plan on pumping for a long time on a regular basis. Almost every day for a year or more. • Sound Quality- Do you want your pump noisy or quiet? Most battery and plug operated pumps are pretty noisy. Not to the point of irritation. At least not for me. But you might want something a little more discreet, quiet, like a hand or foot operated pump. • Price- Price may not be a big deal for you, but for some of us it is. There is one thing to remember about price; don’t base your decision on price alone. I did that with my first breast pump. I bought a cheap one based on price alone, (for the sake of argument, let’s say under $100 is cheap, over $100 is expensive) and was very disappointed with the suction quality. I was engorged and even after my let down and pumping with this cheap breast pump, I was still engorged. I ended up wasting money in the end because I couldn’t return it after buying another breast pump because it was used. And I didn’t want to give it away because it worked so horribly. The money you’ll save on not having to buy formula, will be more than the price of the most expensive breast pump. Not all cheap pumps are like this though (don’t worry, I’m not going to list it here as a recommendation). The breast pump I bought after that has been with me for 7 years and counting, and used for 3 babies. I even let a friend borrow it when I was in between babies. (Yes, I know they say not to share your breast pump, but you can sterilize the pumps in boiling water. Besides, we eat and drink after other people every time we go to a restaurant and use a spoon, fork, plate, bowl, or cup. The dishes aren’t cleaned that good). • Efficiency- How long does it take to get the milk out. This goes back to buying a cheap breast pump. Some breast pumps’ suction is just better than others and they’re able to draw the milk out a lot quicker. It’s also dependent on how long it takes your breasts to let down. With those considerations in mind, let’s look at some breastfeeding pumps that are recommended by mothers all around. - Based on the considerations, this pump is good for long term usage, the sound quality is loud, it uses a plug, batteries, or car adapter. The price is expensive and the efficiency is good. This is the pump that I’ve had for 7 years and used on 3 babies, and it was worth every penny I spent on it! The price of this pump compared to the amount of money I would’ve spent on formula in all those years doesn’t even compare. I would have spent in the thousands of dollars on formula, and this pump doesn’t even come close to being one thousand dollars. • Ameda Purely Yours Breast Pump with Carry All or the Ultra or the Backpack or the Breast Pump only- Based on the considerations, this pump is good for long term or short term usage, the sound quality is loud, it uses batteries, plug, or car adapter. The price is expensive and the efficiency is good. 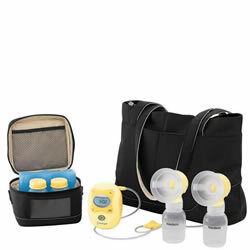 I know a lot of mothers who absolutely love the Ameda breast pumps! - Based on the considerations, this pump is good for long term usage, the sound quality is quiet, the price is expensive and the efficiency is good. This pump is also hands free! So you can pump while…..typing! • Medela Harmony Manual Breast Pump - Based on the considerations, this pump is good for short term usage, the sound quality is quiet, the price is cheap and the efficiency is good. This pump is great for lightweight travel! • Versa Ped Foot Powered Breast Pump- Yes! There is a breast pump that you operate by a foot pedal! Based on the considerations, this pump is good for short term usage, the sound quality is quiet, the price is cheap and the efficiency is good. Just like a hand pump, this breastfeeding pump doesn’t need batteries or a plug because you’re making it work by pumping the pedal with your foot. And it’s just as lightweight as any manual pump. Now that you know some things to consider when looking for a breastfeeding pump, go get the one that fits your lifestyle! Keep giving your baby your sweet milk. Don't see your favorite breastfeeding pump listed here? 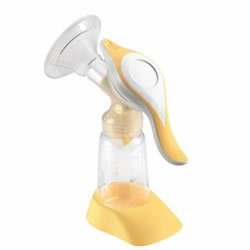 If there is a breast pump that you absolutely love and I haven't mentioned it here, let me know and I'll add it right away, with your comments next to it!